Exact setlist unknown, the above songs are confirmed to have been played. 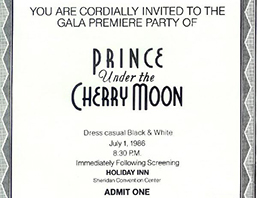 This was the premiere party for Under The Cherry Moon held at the Centennial Theater in the unlikely location of Sheridan, Wyoming (population 10,369). Local hotel clerk Lisa Barber 'won' Prince as her date and 200 free tickets for the movie's premiere in her hometown in an MTV contest. 10 minutes of this set (Raspberry Beret, Delirious, Controversy, Mutiny) were broadcast by MTV. This page was last modified on 16 May 2016, at 11:03.